We already know that Haiti is the poorest country in the Western Hemisphere, but what does that really mean? There are staggering statistics about the extreme poverty of Haitians, the devastating infant mortality rate and the number of people who go hungry and can't provide for their families. These numbers, while unbelievable, don't even begin to describe the sacrifices people make just to survive. This includes abandoning children and disowning aging family members. On several occasions, volunteers traveling in Haiti have been offered a child in hopes that they will be taken away from all the devastation and given a better life. But Haitians are just like us. They want to work and go to school. They want safe communities and the opportunity to provide loving homes for their children. Haiti's children are filled with a remarkable and resilient spirit. They are the reason our volunteers are devoted to the plight of the Haitian people. There are countless non-profits working in Haiti today. Many of them have been there for decades, trying to build a stronger and healthier country. Haitians know that foreign aid workers are there to help. Global Family Philanthropy believes that by working together we can make real change. We are having success in Haiti, not only because of strong partnerships, but because of devoted volunteers. Our teams of individuals and families who travel to Haiti, experience first-hand the power of working side-by-side with Haitians to make change. Whether our volunteers are teachers, nurses, electricians or stay-at-home moms, they are learning about the culture and impacting lives...including their own. We've created a loving home for abandoned children, where our Haitian family thrives while attending school and living in a family-style home. We provide jobs for our Haitian staff, who otherwise would not have income. As a result, they're able to care for their own families. We believe that as a team and as a family we can make serious change in our small corner of Haiti. With dedicated volunteers, informed donors and supportive fellow non-profits we can help provide a future for our Haitian kids. It's hard not to fall in love with these kids. They're funny, giggly, pesky and full of life. They wear their school uniforms like a badge of honor. They take pride in their good grades and boast about what they've learned. When we see our GFP kids now, it's hard to believe the change from when we first met them. Several of our kids were living on the streets or squatting in houses without electricty or food. They were hungry and scared. Our GFP home and our Haitian staff have created a place where kids can be kids. 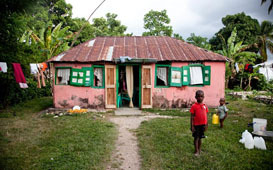 This home was created by volunteers and funded by people just like you. They, too, believe that children should have a healthy environment to grow up in. Maybe it's your turn to fall in love with our kids. Join us in Haiti. Bring your family, roll up your sleeves and let's get to work. Our Global Family grows everyday with new volunteers willing to work here and abroad. They fundraise, hold toy drives or simply help spread the word. One single moment of love can have a profound and prolonging effect. Join us today. "I don’t want any child to be without love. On my first volunteer trip to Haiti, a little girl was offered to me. At that moment, I knew I had to do more for the abandoned children of Haiti. Our new found family inspires me, my husband and our two daughters everyday."